Popovers have a way of turning regular meals into really special ones. They’re so light and airy and can be made sweet or savory with the addition of good butters, jams, salts, etc. I have a sweet tooth, obviously, and love them with a big helping of strawberry jam, but I’ve also had them with gruyere and sea salt at dinner, and they’re equally special. 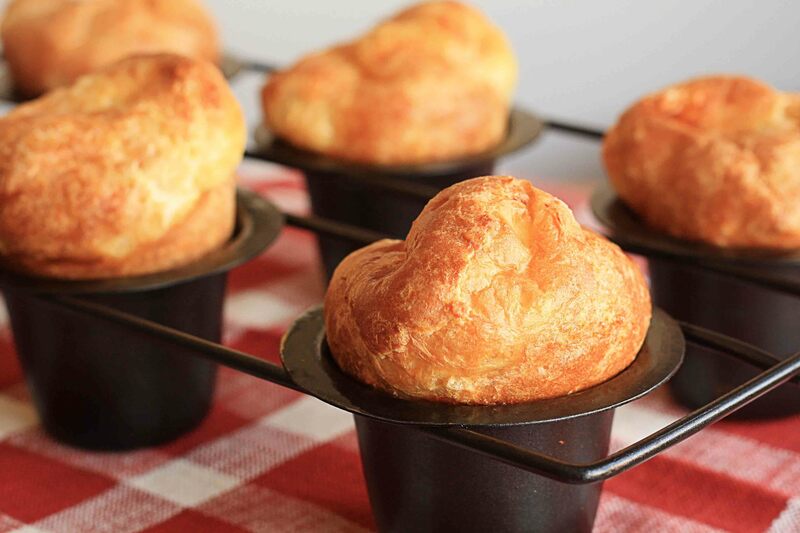 Have you ever made your own popovers? It turns out they’re super easy to make and require only the most basic ingredients. It’s worth ordering a popover pan (like this one) so they turn out perfect every time. Preheat your oven to 450F. Generously grease the popover pan and place it in the oven while the oven preheats. In a medium bowl, lightly beat the two eggs. Add the milk, melted butter, flour, and salt, and quickly beat with a whisk until just combined. Do not overmix. You just want to incorporate the ingredients and get the mixture to a creamy consistency. Remove the popover pan from the oven and pour the batter into each section, filling them about half way. Bake for 20 minutes at 450F, then, without opening the oven, lower the temperature to 350F and bake for an additional 20 minutes. Serve the popovers immediately with your choice of toppings. This entry was posted in bakery, recipes and tagged brunch recipe, easy breakfast recipe, popovers, recipe. Bookmark the permalink. I have a pop over pan, can’t wait to try your recipe! popovers are really cute but I just can’t find the right pan, is it okay if I make them on a muffin pan? I would definitely recommend using a popover pan if you can find one. A muffin pan is an okay substitute, but your popovers might not rise to the same tall shape. Try using a muffin pan that’s heavy and dark, because it will retain heat better. I’ve also read that you should only fill every other tin of a muffin pan so that the popovers have room to expand. If you try this, let me know how they turn out!